Fully updated and revised, the trusted Australian Nurses’ Dictionary, 6e remains the only pocket-sized dictionary specific to Australia and New Zealand. 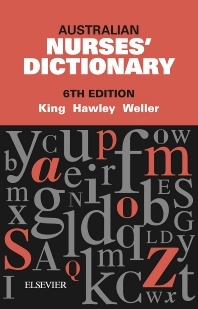 Compiled by Jennie King, Rhonda Hawley and Barbara Weller, this dictionary features comprehensive nursing definitions, guidelines, terminology, policies and procedures, and provides a quick reference source for students and nurses in the clinical setting. In addition to numerous everyday nursing terms, definitions extend to include specialist areas such as complementary therapies, health informatics, nursing management, midwifery, education, research and ethics. Pronunciation guide for every definition.